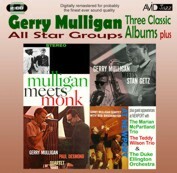 AVID Jazz here presents three classic Gerry Mulligan albums recorded in 1957, including original LP liner notes plus extra material live from the Newport Festival on a finely re-mastered and low priced double CD. Mulligan Meets Monk there is only one way to describe this classic LP and that is to borrow the words from the original liner notes written by legendary producer Orrin Keepknews. This is one of those once in a lifetime meetings of giants... a rare meeting of major facets and major figures of jazz. It is... intriguing and provocative... in all probability a significant document, a piece of jazz history... but surely there has never been a more enjoyable historic occasion than... when Mulligan met Monk. We at AVID will certainly drink to that! Gerry Mulligan Meets Stan Getz... Another meeting of giants and again we must hand over to yet another legendary producer Norman Granz who was best placed to describe the meeting! Obviously each is a master of his instrument... Stan picked the rhythm section with Gerrys approval... as an added fillip Mulligan suggested that they trade horns... so on side one Getz plays baritone and Mulligan tenor and on side two each plays his primary instrument. We present here the Mono version of the LP as we feel it presents a more natural and intimate sound quality. Gerry Mulligan & Paul Desmond Quartet... Well were on a roll so lets hand over to another legend Nat Hentoff to describe our next meeting of giants! The idea for this multi linear playground has been bottled... in Paul Desmonds mind since 1954 when Gerry Milligan sat in with the Dave Brubeck Quartet at Carnegie Hall... results convinced both Desmond and Mulligan that their ways of speaking music had what Gerry terms a natural affinity. Nat continues... Both... are quite pleased with this session... Desmonds explanation of his enjoyment in working with Mulligan is succinctly clear... He just does all the right things. Take a listen and we think you will agree! Extra bonus material includes Gerry Mulligan recorded live at Newport with the his own Quartet featuring Bob Brookmeyer, the Marian McPartland Trio, the Teddy Wilson Trio and Duke Ellington & his Orchestra. All three albums have been digitally re-mastered for probably the finest ever sound quality!